The 500 year flood that recently hit Eastern and Central Iowa may alter more than just the countryside of the Hawkeye State. The devastation is likely to send a profound ripple through the country's political landscape and into the upcoming election. With the 2008 presidential race now in full swing both candidates are vying for crucial swing states. Iowa's importance, like its geography will remain a central point of the contest owing to the margin of victory in each of the last two presidential elections (10,059 votes in 2004, 4,144 in 2000). The affected area is massive but largely decentralized with Governor Culver (D) declaring 83 of Iowa's 99 counties state disaster areas, 42 of these counties have been declared federal disaster areas. People are affected by this event, they are homeless; they are unemployed; they are without basic necessities; they are left with no means of moving forward. The farming year is over; the vast majority of crops have been ruined and there is no hope of salvaging the harvest in most areas. The farmers themselves are covered by the farm bill of 2002 that provides a subsidy in the neighborhood of 70% based on their theoretical yield; but they don't get a free pass as their yield, or lack thereof affects future subsidy awards. But these natural disaster subsidies won't cover the other 79.4% (USDA, 2002) of Iowa's workforce employed by an industry other than farming. For the vast majority of Iowans affected by the flooding, federal aid will be their only hope. The people of Iowa deserve help just like the people of New Orleans deserved help. The problem however lies in the Federal Emergency Management Agency's (FEMA) complete inability to provide for citizens in need. Whether FEMA's idiocy was a choice or complete incompetence regarding New Orleans the same results or lack thereof cannot happen in Iowa without dire consequences. If for no other reason the Bush Administration should help Iowans for the political expediency of the Republican Party. Under the current circumstances, if aid is not provided, the political climate in Iowa will shift as troubled residents hold the ruling party responsible for their current situation and defect to the Democratic side. The size of this shift would be difficult to predict, but with the margins of previous elections it's a safe bet that Barack Obama has the state locked up unless the Bush Administration provides an unprecedented amount of aid to the people of Iowa; but based on previous encounters, like their response to Katrina, this preposition seems unlikely and thus I feel confident declaring Barack Obama the winner of Iowa's seven electoral votes. Update: It also doesn't help that McCain was asked by Governor Culver to cancel his visit to Iowa because it would divert attention away from flood relief. Many of the police officers currently charged with handling the thousands of people displaced by the flooding were placed on security detail for the McCain visit. 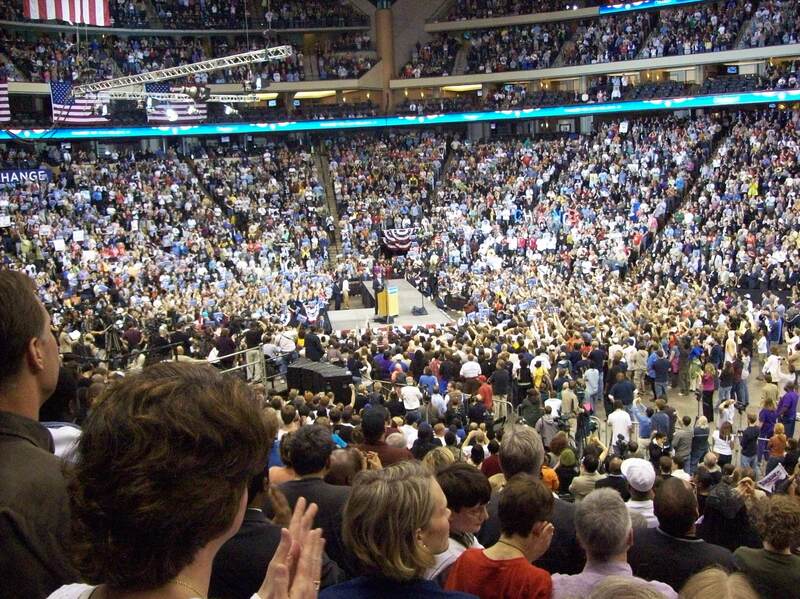 McCain pledged to help the people of Iowa while those actually helping the people were helping McCain instead. 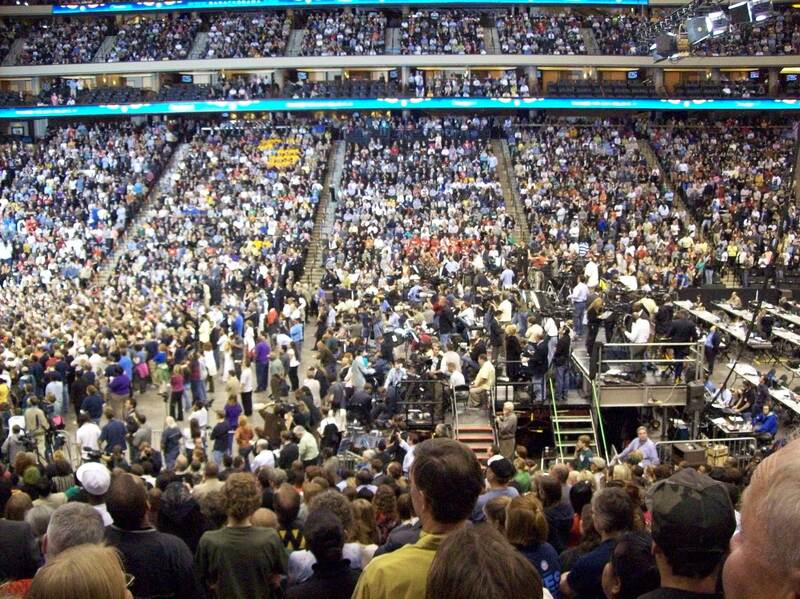 The Xcel Energy Center seats around 18,000 when configured for hockey, and doesn't take 3 hours to reach full capacity like it did on this historic night. I drove by the main entrance under a light rain at around noon and observed that roughly 60 people were waiting in line. 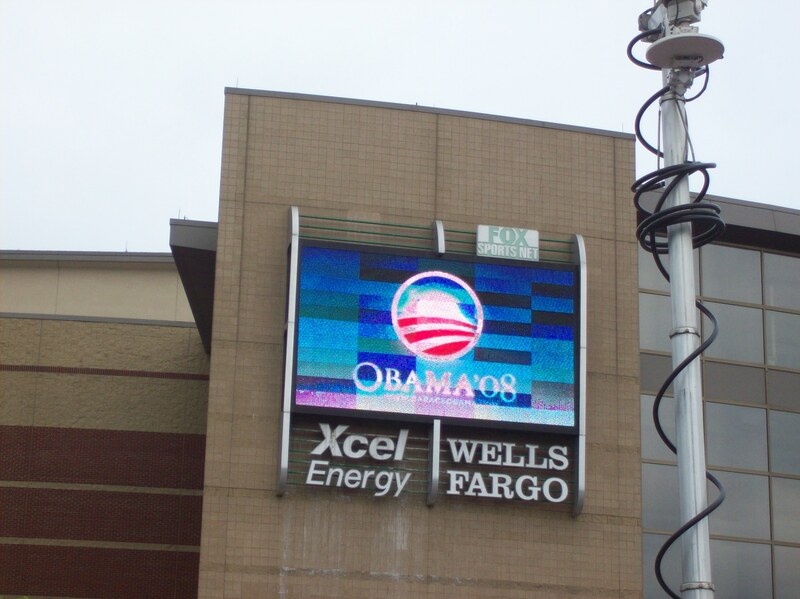 I returned some four hours later and walked over a mile from my parking spot, an unenforced meter, to the front of the Xcel. From there I followed the line several blocks until I finally reached the end around 4 pm. The doors were scheduled to open at 7 with the speech beginning at 8. For the next two and a half hours I stood in roughly the same position and watched a never ending flow of people walk past searching for the rear of the line. I would later find out just how long the line truly stretched. When the line began to move at 6:30 progress was slow. The path snaked across streets and up and down sidewalks eventually converging on a fenced off area infront of the main entrances. The crowd was instructed by volunteers to empty their pockets of anything metal to expedite the security process. Upon clearing security the foyer was relatively empty with staff directing everybody to move to the right. There were no seats in this section and the vast majority of people migrated to the opposite side of the center where there were plenty of vacant seats. I was positioned at what would be center ice with a nice frontal view of the podium. At this point it was all about being patient. 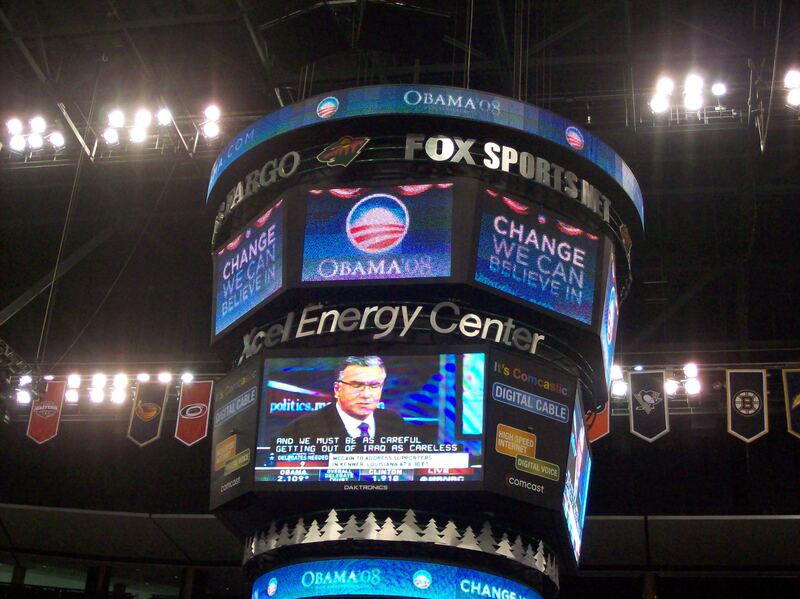 MSNBC was playing on the large jumbo screen up until the point where Kieth Olbermann announced that Obama was within 9 delegates of securing the nomination. For the next 2 hours people continued to file in as I sat in a news blackout. 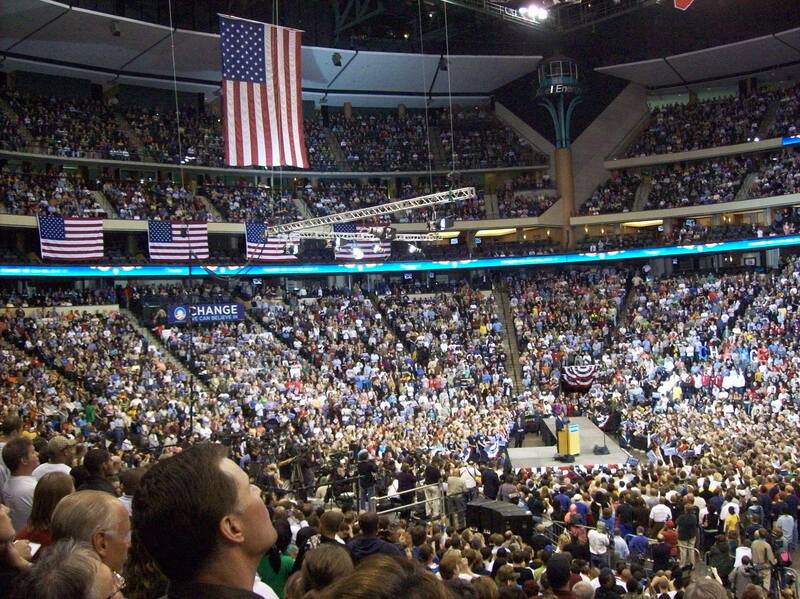 I had no way of figuring out what was happening in Montana, South Dakota or amongst the Super Delegates because they changed the programming and it was simply too loud to call anybody. 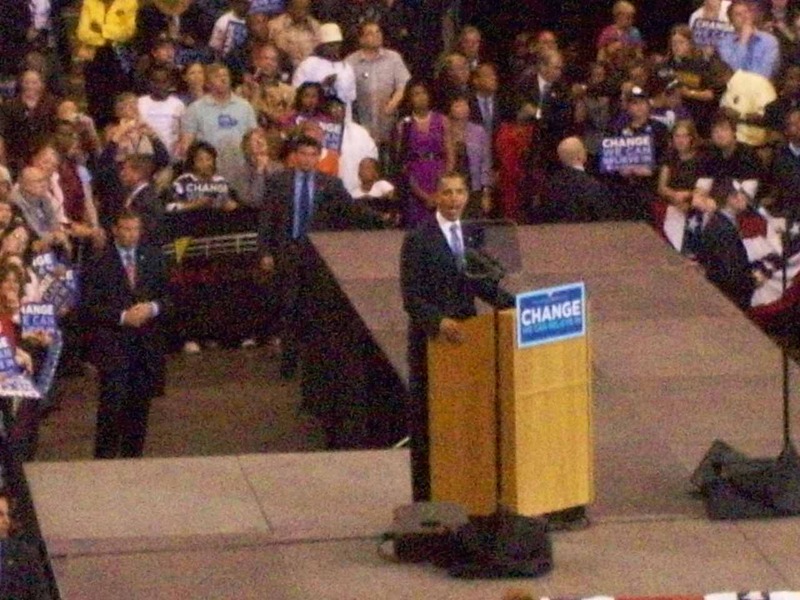 As the time passed I watched the campaign staff distribute American flags and "Change We Can Believe In" signs to those situated directly behind Obama within camera range. The staff led them in a few practice flag waves and called it good. 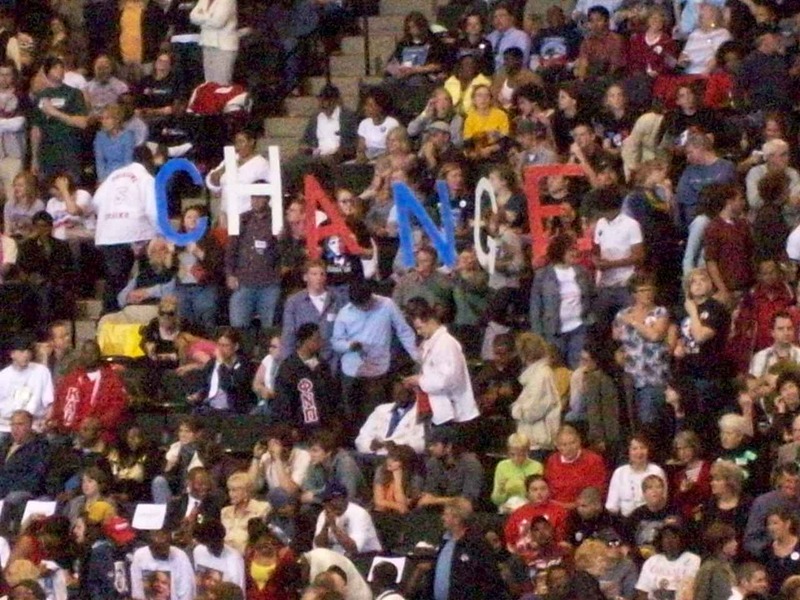 At about 9 o'clock the seating capacity was reached and nearly every general admission seat was filled with the exception of those behind the press tower. At this juncture a staff member held up a hand written sign on what appeared to be a white board with the words "5 min to SPEECH." 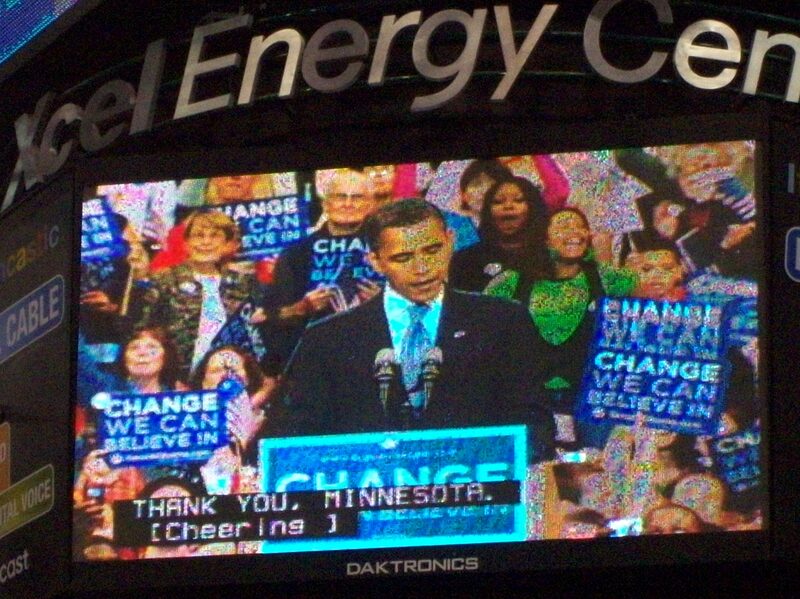 About 30 seconds later the 5 was replaced by a 2 and in another 30 seconds a professor from the U of MN arrived at the podium to set the stage for Barack Obama. He walked out of the tunnel to what was described as "Loud Applause and Cheering" by the internal closed captioning on the jumbotron. His speech began. At this point I assume you watched it if you're reading this so I'll skip to the end. Upon conclusion he did a few waves to the crowd and scaled the stairs to do a victory lap around the inside of his podium area shaking hands and smiling. It took around 20 minutes for him to circle the infield and disappear back into the tunnel to a thunderous applause from those who still remained. At this point I left. Throughout the entire event I probably took around 40 pictures which I'll selectively post in the morning. 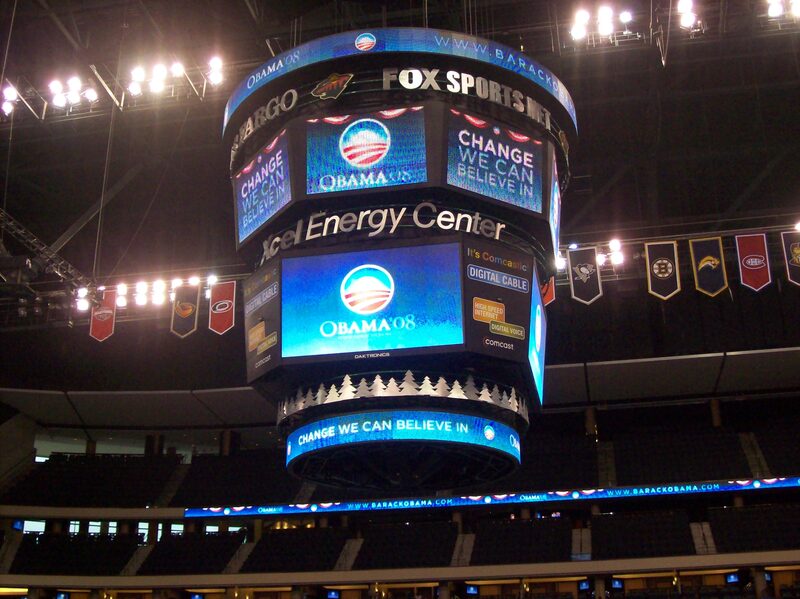 The final attendance for the event as estimated by the St. Paul Fire Marshall was 17,000 people inside the Xcel Energy Center leaving 15,000 outside to watch the event on the enormous monitor on the exterior of the buidling. The police blocked off what appeared to be a 1 or 2 mile radius around the building to accommodate those who did not make it inside the doors.